You are here: Home / Recipes / Mashed Cauliflower Recipe! 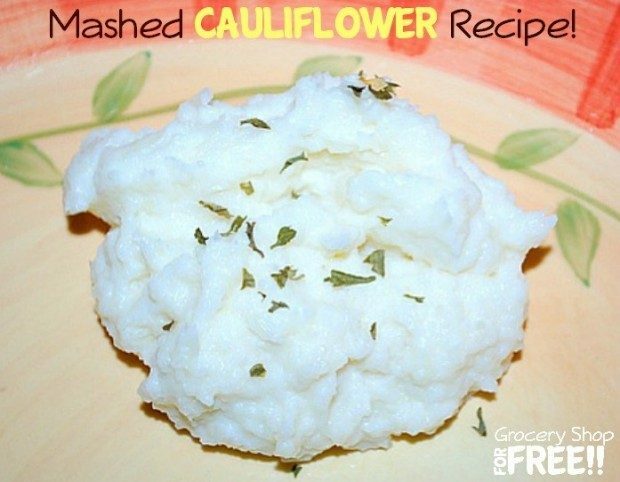 If you are a mashed potato lover but are trying to cut out starch, give mashed cauliflower a try! I won’t lie, it doesn’t taste exactly like mashed potatoes. However, it is a pretty good substitute. 1 Head Cauliflower 1 Clove Garlic, pressed 1 Tablespoon Butter 2 Tablespoons Milk (more or less) 1 oz. Non-Fat Cream Cheese Salt and pepper to taste Cut the head of cauliflower to detach the florets. Place the cauliflower and garlic in a steam pot or microwave safe dish. Steam the cauliflower florets until soft. I steamed them in the microwave for about 8-9 minutes. Use a potato masher to break up the cauliflower florets. Add butter and milk. I used a hand blender to mix the cauliflower and make it smooth. Add in the non-fat cream cheese, salt and pepper. Mix until smooth. If you’re apprehensive about trying just cauliflower, mix in some mashed potatoes. Steaming is better than boiling the cauliflower. Boiling vegetables takes some of the nutrients out. Mashed Cauliflower would be wonderful served with the meatloaf muffins!